The most eye opening thing about my summer spent working in disaster relief was the realization of how often what someone intends to help actually has the opposite impact. I wrote this article in hopes that sharing what I learned about disaster relief and donations might help people know, in advance, how to effectively help disaster survivors the next time your school, church, or civic group rallies for donations for a disaster stricken community. 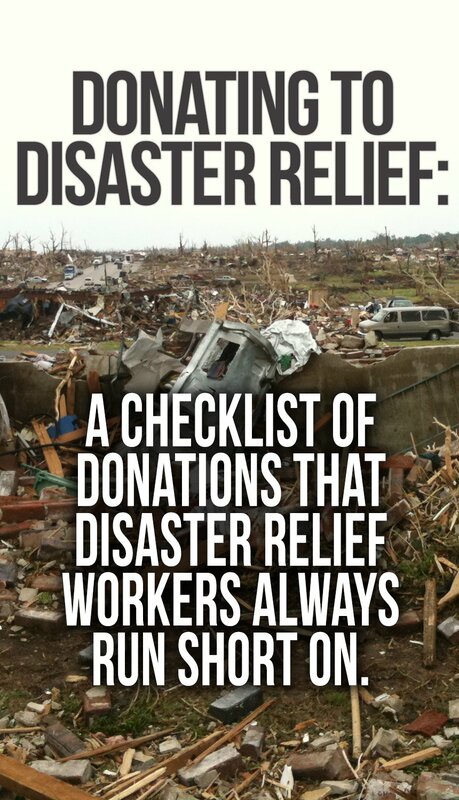 Helpful, organized donations of appropriate supplies is most important in the days immediately following the disaster. Being able to find shoes that fit or cough syrup for a sick first responder is easier when the volunteers are able to locate well labeled supplies, aren’t encumbered navigating around unneeded supplies, and are available to victims and first responders instead of occupied sorting and folding donated clothes. Donations of goods were desperately needed and appreciated following the Joplin tornado, but hundreds of volunteer hours were wasted sorting donations of garage sale leftovers and half-used personal product. Similarly, thousands of volunteer hours are wasted after every disaster sorting shoes, clothing, linens, and begging- what disaster response professionals have called the secondary disaster. Relief centers will be flooded with these basic items, so your donation would likely be put in storage, sold, or given to non-victims. Relief centers are flooded with toiletries and used clothes after a disaster, but these items don’t help at all. 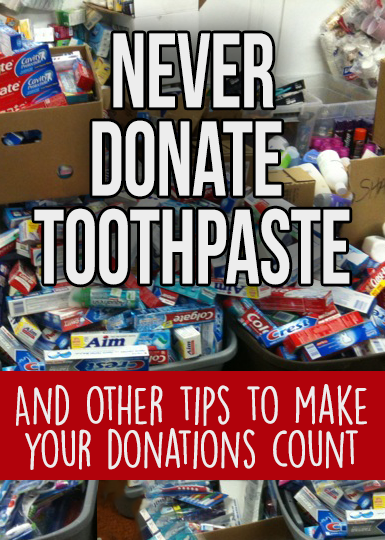 Read on to find out about more effective donations. Camping supplies,especially cots & air mattresses. For parents spending their days with FEMA forms and insurance adjusters, small activity-toys are critical needs. I’m adding this in my 2016 article revision as I am completing my Masters in Counseling. Knowing what I know now, I wish we could have supplied more children with open-ended toys, supplying them the means to help make sense of their experience through play. NO LARGE TOYS. Disaster Relief Centers serve exhausted survivors trying to figure out next steps on little sleep, bleary eyed volunteers, and steadfast first responders, in these situations soda and energy drinks have perhaps their most appropriate use. Morale matters. On one day that summer, a generous donation allowed us to pause and make lattes for our team and it was a kind moment of rest in a difficult time. Crowded relief centers populated by sleepless and stressed out victims and volunteers incubate illness. Pain relievers were also a constant need. Our disaster leveled every tree for miles and sent crews out all summer into heat and bugs. Preparing them appropriately helped our work crews help victims more efficiently. Needed as much by rescue workers and volunteers as by victims, preventing further discomfort and injury is a part of healing and rebuilding. Many disaster victims survive wearing only sandals or dress shoes, and some survivors, with no home or car, can walk so much they’ll wear shoes out in a few days. Tape them together with strong tape, and label with a permanent marker. No boxes. As a rule, donating clothing is a bad idea. Volunteers spend thousands of hours sorting clothing after a disaster, and after truckload after truckload appeared at our relief center loaded with donating clothing we began to turn more and more away. A month or so after the storm, I talked to pastors and civic leaders who’d driven thousands of miles with a trailer of donations and because the trailer contained clothing, no relief center would allow them to offload because clothing filling the relief centers was such a huge burden. Immediately after the storm, waiting for the insurance adjusters to arrive and assess, clothing did reach the people who needed it most. A clean change of clothes when you’ve lost everything and spent the day in the heat salvaging what you can of your belongings is a precious gift. 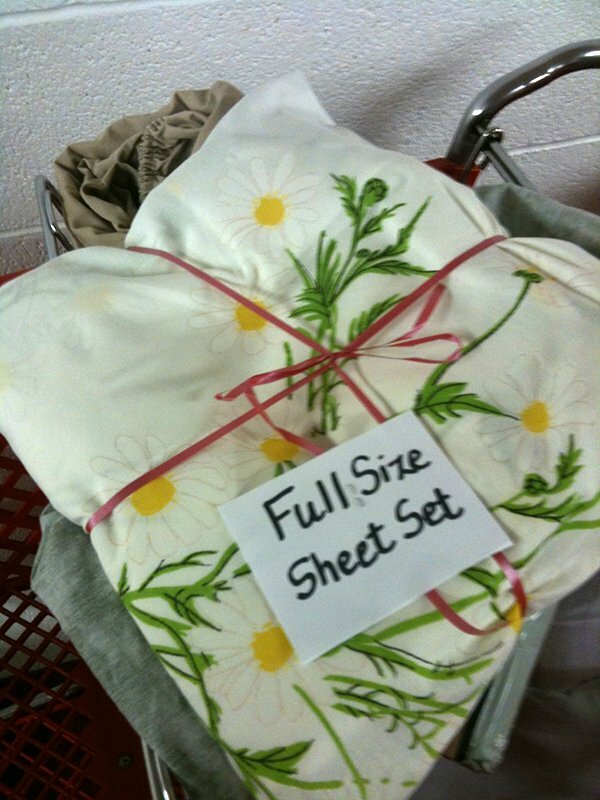 One church, at that time, delivered to our building packaged sets of clothing, new or like new tops and bottoms, packaged with new socks and underwear, and clearly bundled in plastic bags and labeled. THOSE donations reached the people they were intended for. Sizing, sorting, & folding clothing is such a time consuming task that in after a disaster many shelters and relief centers will absolutely turn away any vehicle trying to deliver a load that includes boxes of clothing. If you have a lot of clothing, consider instead having a garage sale at your home and donating the proceeds. Make sure shoppers know the proceeds will benefit the disaster survivors- and you’ll be amazed at the success of your sale! Involve your kids by letting them sell snacks or drinks. One young lady’s lemonade stand for Joplin raised nearly $500 in 2 days. Bound, labeled, and laundered sheets ready to be given to a family in Joplin. Fresh, pantry items, canned, anything- Relief centers will serve hundreds of thousands of meals to victims and volunteers in the weeks following a storm, and Distribution Centers will try and help ease the cost of restocking a pantry for affected families below the poverty line. clean, folded, and bagged or bound. Spring is tornado season, and cleanup from a disastrous storm last into and through the summer- often made hotter by the complete loss of the area’s tree canopy. A donation of electrolytes keeps work crews safe and able to help. It’s okay to want to donate real, tangible items- but understand that every organization has expenses and those explode following a disaster. As much as our center was able to use willing hands and generous, well considered donations we also needed office supplies, gas to send trucks of food and water into the disaster area, money to pay the utilities that skyrocketed when the building went from being filled only Sunday morning to being at capacity 24/7, and other expenses we’d never considered. Cash was essential to be able to function helpfully in our community. If you want to donate towards something tangible ask an organization what they need and provide them the resources to meet that need. One church, when we told them the toilets in our building were struggling to accommodate the number of people staying in the building at night, arranged for new toilets and a plumber to be there within 48 hours. Another group, after calling us and hearing the need, arranged for a nearby appliance store to deliver two freezers. One group, hearing we were having to turn people away, arrived with tools, wood, and mattresses to build rows of bunk beds in a room that previously held rows of cots. Most of all, pray for survivors, their families, first responders, rescue workers, and for the relief workers. Pray your donation will meet an immediate need and bring some comfort to someone who is hurting. Pray for physical healing for those injured and a healing of the heart and mind for those who found themselves in a situation they never imagined and saw things the rest of us hope we’ll never have to see. A simple note of encouragement can be a powerful donation and can be a way to help children cope with the disaster coverage they are seeing in the media. 2016 Update: I recently ran across the forms we created to use when we were talking with a victim about what supplies they needed, this conversation/interview was always done in a quiet, calm room with a mental health counselor when available. This was an intentional space to invite a lower level of stress/cortisol and allow the person to reach out or disclose symptoms which might indicate acute stress disorder (a normal response to a traumatic experience that has the potential to turn into PTSD if symptoms persist). The form was then sent into the warehouse of supplies and brought up by a volunteer. This Disaster Victim Assessment & Donation Needs Form is available via .doc & .pdf.